Institute Football Club will play its home Irish Premiership matches at the Ryan McBride Brandywell Stadium for at least another year. 'Stute was forced from its Riverside stadium after heavy flooding in 2017. The club has played its 2018-19 home games at the Brandywell, home to neighbouring Derry City Football Club. Chairman Bill Anderson said the club will play at Brandywell for "at least next season and probably the season after that." 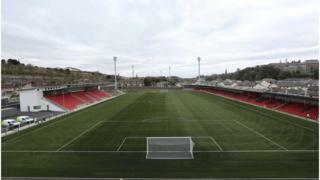 He told BBC Radio Foyle the club was delighted Derry City and Strabane District Council, owners of the Derry stadium, had agreed to extend the stay. "Brandywell has been good to us this year, the people of the Brandywell have been good to us, and Derry City fans have been good to us," he said. He said in the wake of the floods and subsequent difficulties in getting flood insurance, the club was faced with a "very difficult decision". "If we put any money back into the Riverside and it flooded in five years' time and we had no insurance, we would be finished as a club." The club is looking at longer term options as it looks to return to Londonderry's Waterside. A site at Clooney Park West has been chosen as the preferred option for a new ground following a consultancy exercise. The club's former Riverside home on the banks of the River Faughan, had a capacity of 3,000. It underwent a £1m upgrade in 2010. The club leased the ground from Londonderry YMCA and was ten years into a 25-year lease.